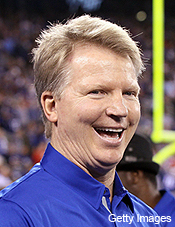 Phil Simms 11 had the most liked content! So the Eagles get Howard and also gave up 5th but will get back a 4th round pick? What’s the downside? Bears I thought we’re in win now mode. Bad trade for them. I don't mind the Pats getting in if they lose it. Theres going to be a trade with the Chiefs and Sammy plus a pick going to the Steelers. I read the kick was blocked, that legit? Tough loss. Trubisky showed some signs he may reach Eli status just yet. I thought the kicker was a good one, seems he was pretty average this year just checking the stats. Wait, its a post you knew was just a misunderstanding from months ago? You cant do an I told you so to an accidental post. Don't see Ben getting traded any time soon. And I doubt this is Brown or Ben as an ultimatum, Brown is asking to be traded period. Move Forward with JuJu, Conner & Ben and trade Brown for a few picks. Use one of the picks for a receiver and what else do they need? Looks like they force a real low amount of turnovers, maybe they need some defense help.